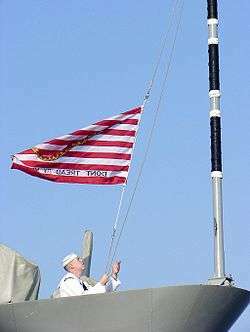 This article is about a flagpole on a ship. For the superhero, see Jack Staff. A jack staff (also spelled as jackstaff) is a small vertical spar (pole) on the bow of a ship or smaller vessel on which a particular type of flag, known as a jack, is flown. The jack staff was introduced in the 18th century. The jack is typically flown from military vessels, including submarines, while at anchor or moored pierside, but not while underway. Civilian vessels such as private yachts have also been known to fly the jack of the nation of their homeport, also from a jackstaff, while moored or at anchor. ↑ "The U.S. Navy's First Jack". Frequently Asked Questions. Department of the Navy — Naval History and Heritage Command. Archived from the original on October 4, 2012. Retrieved 2012-08-24. ↑ Nicolls, Cdr Bruce, OBE RN (Retd). "The Union Jack or The Union Flag?". Flag Institute. Retrieved 2012-08-24.